Last week I posted about my stay at The Vineyard Hotel, excluding a mention of the dinner in their main restaurant because I wanted to devote a separate write up so I could capture the detail. The evening began with a glass of English sparkling wine served with olives, smoked almonds and crispy balls filled with mushroom in a sophisticated lounge setting with an open fire and cosy lighting. After drinks we were led into the main restaurant. Being just the two of us, my husband and I were fortunate enough to be seated in a semi-private room, overlooking the other diners. It was a privilege to sit in there as we could admire up close the wonderful art adorning the walls and it felt like the perfect balance between atmospheric and intimate. 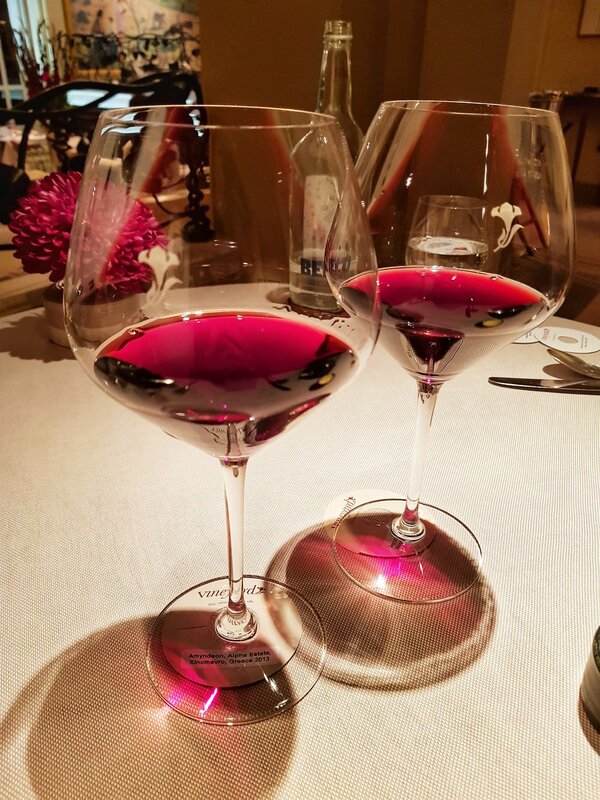 Our dining experience consisted of the five course Discovery Tasting menu with matching wines. The idea behind this is that we would be introduced to wines that perfectly matched the menu; wines from grapes and regions of countries that we may never have even considered before. I knew that the dining experience certainly looked special from my research on the website and looking through photos. Then when I saw the luxurious restaurant, white table cloths and well-presented staff I really started to look forward to experiencing the results of a much anticipated meal. The kitchen is led by Devon born Head Chef Robby Jenks whose experience includes three years of working under the legendary Chef Michael Caines at Gidleigh Park and most recently earning 3 AA rosettes at Amberley Castle, a luxury castle hotel in Sussex. To start we were then given a sweet and creamy amuse bouche served on a spoon and accompanied by a 2016 Viognier Dindori from India. I had never had Indian wine and didn’t know what to expect, it was really interesting, full bodied with hints of peach and very drinkable. Our sommelier Boris Nikolaev took great pride in sharing the details of the wine with us and took us on an intriguing journey throughout the evening. Our first plate consisted of gorgeously meaty braised octopus and barbecued sweetcorn in a seaweed broth. A refreshing yet hearty concoction and I especially liked how the barbecuing accentuated the flavour of the sweetcorn. The seaweed broth was like a cashmere blanket on a winters evening, warm and comforting. Next we had beef sirloin tartar, sorrel sorbet with raisins and a bone marrow crumb. Now, I have never liked the idea of beef tartar even though it is said to be a true culinary classic and I was definitely hesitant in trying this one. I took one mouthful and with such an explosive mixture of flavours and both crunchy and buttery textures, I could see why Chef Robby had created a dish that could perhaps ease you in to the idea of tartar. For me, it worked well although the ingredients initially felt like they wouldn’t. The sorrel sorbet again added a new dimension with its texture and temperature. Sorrel, if you did not know as I didnt, is a garden herb and tastes zesty or tangy and a little acidic. For our wine accompaniment we were given black glasses and asked to guess the colour and grape variety, a really fun challenge especially when you manage to correctly guess that it’s white whilst your husband opts for red. We did not pick the right country or grape variety however and found out that it was a citrusy and fresh 2015 Verdicchio de Matelica from Italy. Next came a generous portion of halibut and several mussels with Wiltshire truffles and chanterelles. Everything about this dish was executed to perfection, especially the creamy herb sauce it came with. This was my favourite dish of the evening and was paired also with my favourite wine of the evening too; a full bodied red, fruity and oaky 2013 Xinomavro from Greece, I will definitely be sourcing more of this wine in the future. We were then served the veal, with chervil and beer-roasted onion and plum. This dish was wonderfully presented and although the veal was tasty, my favourite aspect was the beer roasted onion which was incredibly moist and sweet, falling apart in my mouth. I would love to try and recreate this at home as it would definitely be a showstopper at a dinner party. This was paired with a 2015 Lo-Fi Cabernet Franc, from California. I have had this wine before and felt the flavour was a bit too unusual for me, I cannot even put my finger on what it tastes like. Finally, for dessert we had an almond crème brûlée, with mint and pineapple. A sensational dessert that wasn’t too heavy after many rich and indulgent courses. This was paired with a very sweet 2015 Monsoon Valley, Chenin Blanc Late Harvest from Thailand. Another country I'd never had a wine from and another wine I was pleasantly surprised by. We then opted for the cheese board to share which although we probably could have done without it, I am glad we had it. Another striking course that came served on an elegant bespoke cheese board. I would definitely recommend ordering this cheese, there were four carefully selected varieties and my favourite was the stinky cheese – I will need to get in touch with the restaurant to find out the actual name! As if this wasn’t enough, we were then served petit fours, again in an impressive and bespoke box. There were delicate handcrafted chocolates and pistachio macaroons that came as an unexpected surprise addition. Overall, an exceptional experience where we were transported to food heaven for an incredible evening I will never forget. Highly recommended if you want to impress friends, family or colleagues and enjoy a spectacular lunch or dinner.